You could say that we are hookahed onto the rooftop ambience of Hungry Hippie as well. Because hookah + rooftop is a sure winner. The wannabe flower children in us are in love with the trippy vibes Hungry Hippie gives off. With motley furniture like wooden sofas made from crates, accent chairs, brightly coloured lights on the ceiling and a ton of space, this is the kind of place you’ll never want to leave. Adding to the hippy and trippy vibes is the huge mural of the Hippie Baba on one entire wall. Beautifully done, this selfie spot gives you major #DecorGoals and you’d probably want one in your own room. If you are a hookah person, then you’ve come to the right place to relax and smoke away your blues. With over 20 different flavours include Spring Water, Coffee, Blueberry, Cherry, and something called Nirvana, you will be spoilt for choice. Their signature flavour (and most popular) is the Hippie Baba, which we recommend the Ice Base. Bonus points for super-friendly staff who will help out with anything you need. They’ve always got a smile on their face no matter what you need. 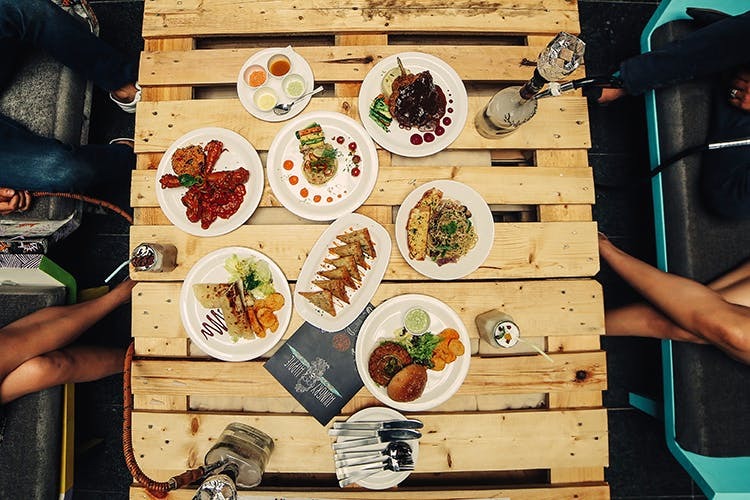 If you are coming with the squad, Chicken Wings, Paprika Chicken Skewers, and Trippy Triangles (samosa-like veg-stuffed munchies) from the Starter menu are good for sharing. Pizza being best-sellers here, you could order anything from the meat-crazy Minced Lamb Pizza to the classic Margherita. Mother cluckers, we suggest either the Peri Peri Chicken or Fried Pepper Pizza. Pasta, sandwiches, wraps, and burgers are your calorie-laden options with hunger-busters in the form of mains such as Chicken Roulade, Mac & Cheese, and Hippie Fried Chicken (house favourite). Pair your food with drinks such as shakes and iced tea and you are all set. With inputs from Ritika Nair.